Archie Smith's biggest challenge awaits as he gets set to ruck against Melbourne's Max Gawn. 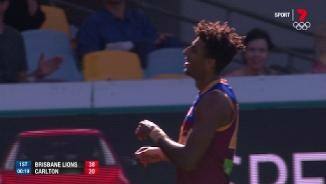 Chris Fagan has put the Lions' big man role up for grabs ahead of Round 1. Archie Smith turned his back on a promising basketball career after developing a love of Australian Rules football at the relatively 'mature' age of 17. In less than 12 months, his ability was obvious and earned him a place on the Lions' rookie list. He now puts his impressive vertical leap and supreme athleticism to use on the football field as an exciting future ruck prospect. • Archie Smith – the son of former Brisbane Bullets NBL All-Star Andre Moore – looked set to pursue a basketball career in the USA, with a number of colleges offering 201cm prodigy scholarship. • His supreme athleticism first caught the eye of Lions Academy scouts during the U18 State Basketball Classics in 2012, and the Club acted quickly to provide him with a possible alternate pathway. 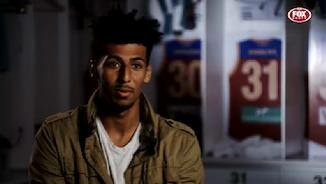 • Although Smith first saw the Academy as an opportunity to get fitter for the upcoming basketball season, he quickly fell is love with Australian Rules. • Less than 6 months after joining the Academy, he was selected to represent Queensland in the AFL U18 National Championships. He played a total of five matches, averaging six disposals and 18 hitouts per game. • He also played eight NEAFL matches with Mt Gravatt and the Lions Reserves, before being drafted to the Club with Pick No.69 at the 2013 AFL Rookie Draft. 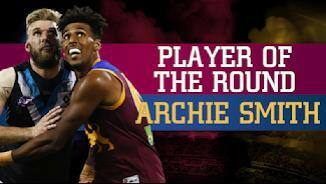 • In less than 12 months since he first kicked an oval Sherrin, Smith was a listed AFL player, with his athleticism and flair in the ruck already drawing early comparisons to West Coast star Nic Naitanui. 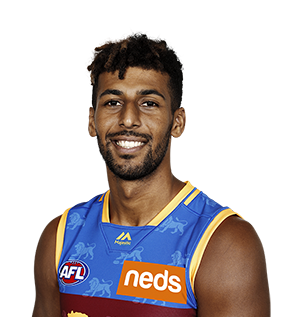 • The 201cm basketball convert was rewarded for his strong NEAFL form throughout the year by making his AFL debut against Port Adelaide in Round 19. • Smith made the most of his opportunity at the senior level by finishing the game with 30 hit outs and 19 disposals, the fourth most of any Lions player on the night. • Smith will look to put forth a big pre-season as he looks to firmly secure the role of second ruckman alongside Stefan Martin following the retirement of Trent West at the end of the season. • Rookie Archie Smith spent his second season at the Club playing in the Reserves. • Smith’s effort was particularly strong in the second half of the season, where he used his big bodied frame in the defensive 50 to make an impact on marking contests.